Officers and volunteers entertain potential members on the ground floor patio. Gillian Hamer loves boating, socializing and fine dining. 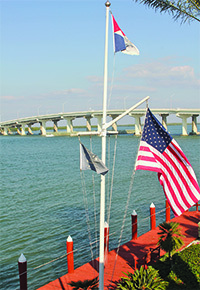 She doesn’t have a boat, but being a member of the Marco Island Yacht Club (MIYC) enables her to enjoy sunset cruises, day cruises and even extended cruises on a “host” boat. It’s one of the perks of MIYC membership and at a well-attended open house this past Saturday, Hamer outlined this and other reasons why she enjoys the club so much. 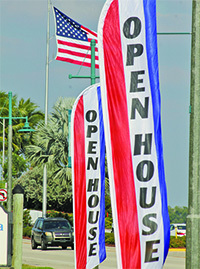 Photos by Quentin Roux:Drivers heading off the island Saturdaywould have seen these promotional signsfor the MIYC open house. 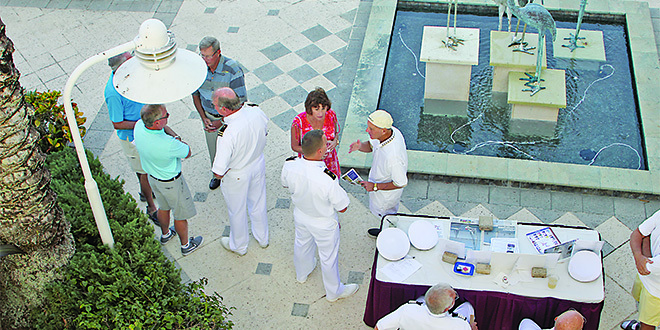 Aylwin and his team) as well as social get-togethers, such as the annual Commodore’s Ball, parties and themed events, holiday buffets and live music, are just a few of the added attractions. At the open house, Hamer was one of dozens of member volunteers who highlighted the assorted aspects of the club to potential members. She joined membership director Ame Arlt. One view of the Jolley Bridge fromthe MIYC. a few sign-ups, as well as positive reactions that could lead to more commitments. Sitting upstairs on the patio and enjoying the pleasant weather as much as chatting to people, sales and catering director Jessica Rigor said the club welcomes clubs and organizations to hold functions on the premises. 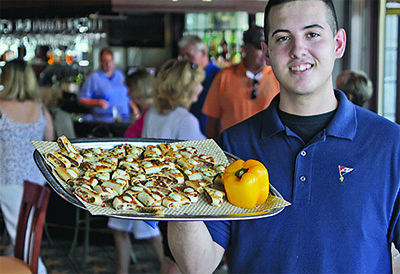 Caruso, a member since 2005, described the club as a “phenomenal place” and somewhere to come for really top-class cuisine. Robert Aylwin, son of chef Bob Aylwin, offers lamb quesadillas. At the moment, social members pay a one-time initiation fee of $2,500, with annual dues of $2,300 and a food and beverage (F&B) minimum of $900. Corresponding amounts for full memberships are $4,500 and $4,300, with no F&B minimum. Both categories receive F&B discounts of 5 percent and 10 percent respectively. Associate initiation fees are at $500 and $2,200 per year, with a $600 F&B minimum. Full members can also buy an equity stake in the club for an extra $5,000. The club is the first recognizable landmark on the right as one drives into town over the Jolley Bridge and its status is underlined by the vast array of boats sitting in their slips beyond. For more information on the club, call marketing director Ame Arlt at 239-394-0199 x 303 or e-mail her at membership@marcoislandyachtclub.net. awesome event! had great time.